Did you know today is National Cookie Day? 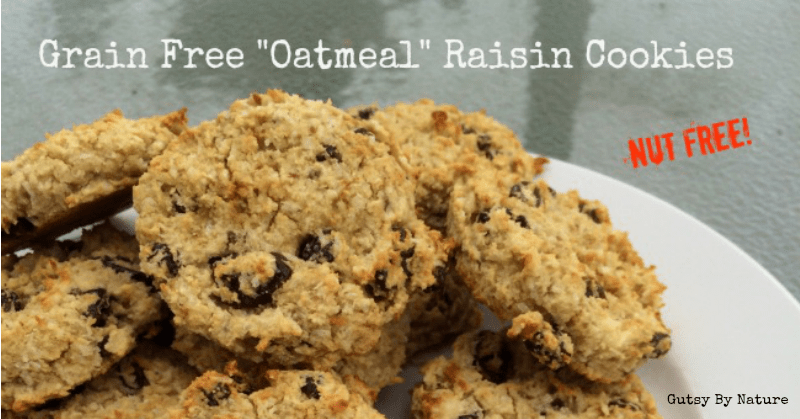 I didn’t either, until I posted a photo of these paleo friendly naturally sweetened “faux-oatmeal” raisin cookies on Instagram and one of my followers told me so. In that case, this seems like a perfect day to post my first ever cookie recipe to the blog! 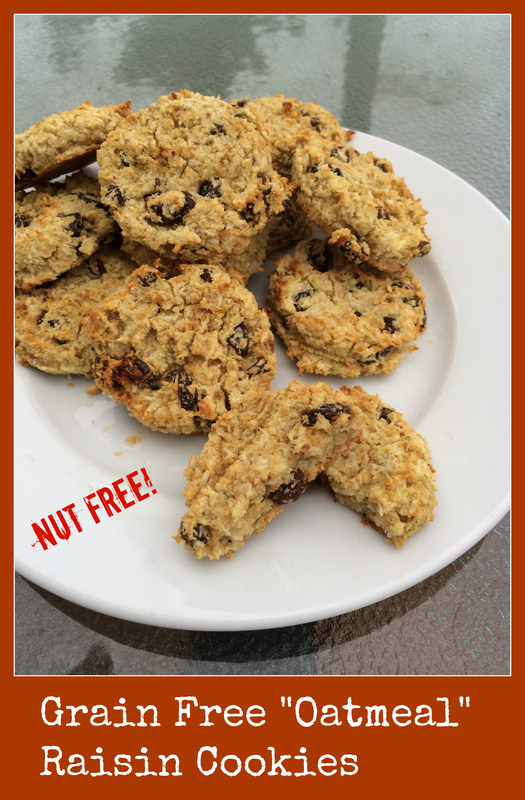 There are several other “not” oatmeal raisin cookie recipes out there in the paleo treat world and they are all delicious, but I’ve yet to find one that doesn’t use almond flour, almond butter, or both. I still haven’t successfully reintroduced nuts into my healing diet and I’m not sure I ever will… my digestive system just doesn’t like them very much. On the other hand, my guts seem to love coconut. And that is a very good thing because this recipe uses coconut in three different forms: coconut flour, shredded coconut, and coconut butter. Not sure where to get all these coconut products? Try my favorite new website for paleo goods: Barefoot Provisions. They carry all three, including an amazing organic coconut butter that is stone ground from whole coconut meat. Click here or on the image below to learn more. This recipe is SCD and GAPS legal without any modifications. Eggs are not allowed on a strict AIP protocol, but they are the only non-AIP ingredient so if you’ve been able to reintroduce eggs this may be an appropriate recipe for you. Coconut is not high-FODMAP, contrary to lists based on early lab testing. However, apples are high in FODMAPs and are one that a lot of people have trouble with (including me) when they are FODMAP sensitive. The per-serving dose is fairly small in this recipe, so proceed with caution. Grain free "oatmeal" raisin cookies: no gluten, no dairy, no nuts, and no sugar! Just lots of naturally sweetened healthy goodness! In a food processor, chop dates so they are extremely fine. Add coconut butter, coconut flour, eggs, apple sauce, baking soda, salt, cinnamon, and nutmeg. Process until a very smooth batter. Add coconut and raisins, pulse just to combine. Scoop onto cookie sheet lined with parchment paper or silicone baking mat in rounded tablespoons, then flatten slightly with a moist hand (they will not spread while baking). Bake for 15 minutes, or until they are beginning to brown around the edges. Remove to a wire rack and allow to cool. Giant Sunbutter & Chocolate Chip Cookies – So, Let’s Hang Out! Shared on Gluten Free Friday, Fat Tuesday, Allergy Free Wednesday. I’ve made these twice now! Delicious! My only complaint is that they are very moist, almost bread-like. Will make again! Thanks! These look great!! I dont usually have coconut butter on hand, do you have an idea as to what would be a decent substitute? Thanks!!! These look great. I don’t usually have dates or use dates in recipes. I was wondering what I could use to substitute them out? I’m not sure. The dates are significant as both a binder and a sweetener. You could try another dried fruit, like prunes or raisins. Let me know if you do and how it works out. I love these cookies so much! I have made them at least 5 times over the past two months. I don’t feel like I’m depriving myself at all with these cookies and I enjoy having one or two as a treat every day. I’m about to try the AIP protocol, though, as basic Paleo isn’t doing enough to address my health issues. I’m wondering if there’s any possible way to substitute for the eggs. Gelatin perhaps? I would hate to have to deprive myself of my favorite cookies for a few months until I can try to add eggs back. Thank you! Awww, you are so sweet! Thanks for the love! I’m currently doing an AIP “reset” myself and it seems to be helping… now you’ve inspired me to test out an egg-free version of this recipe too. I think you could try a “gelatin egg” but I wonder if they would turn out OK without any additional binder… Let me know if you do try! Did you end up trying an AIP, egg-free version? I’d love to hear if it worked!